It’s Monday again which means it’s time for FMM. If you’d like to take part just answer the question on your blog and add your link at the bottom of this post. Also take a few minutes to read and comment on other blogs. Now I want to know about your favorite Thanksgiving dish! And don’t forget to add your link! Our favorite is chicken-apple-sausage stuffing. With Granny Smith apples and chicken apple sausage! YUM. My favorite is the German dressing! It's a recipe from my dad's side of the family and OMG it is the bomg diggity! Seriously, so good…but oh so bad lol. There is a reason we only have it once a year! My favorite is definitely my mom's dressing. So warm, and delicious. I can't wait. My favorite is pumpkin pie. Only my dad and I like it, so I will try to send leftovers home with him! Here is a tip that I use on the turkey. When I was first married and had to cook my first turkey, my mother-in-law said to rub it down good with a stick of butter before putting it in the oven. That would make it brown and crisp. I did that for a long time, then one day I decided to just spray the turkey all over with Pam. It worked great, and it has to save some calories and fat over all that butter! Oh, and I make the cornbread dressing, too. I haven't had Watergate salad in forever – that sounds great! I love the turkey. I put a link to my fav recipe on my page. It's yummy! 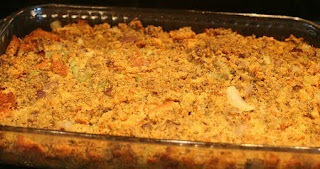 I don't like Thanksgiving foods but I totally grew up on cornbread stuffing too and I was raised in New England. I take it back I love biscuits. Thats the one thing I do eat every year. I'd kind of forgotten about cornbread dressing! Yum! MMMmmmmmmm. I love me some cornbread dressing!!! It's so yummy! I think you're right…it's definitely a Southern thing. I love it! You already said mine… pecan pie. I am going to totally have a small piece for Turkey Day!